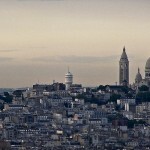 Get away from the noise and traffic the city center and choose your stay on the hill of Montmartre which is one of the most beautiful places in Paris. 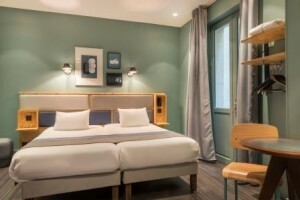 Here some suggestions to find your hotel in Montmartre that will create a unique visiting experience that will carry you away in the artistic and peaceful Montmartre atmosphere. 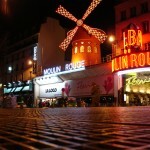 Hotel Montmartre Mon Amour is just 180 m from Sacré-Coeur in the heart of the Butte de Montmartre. It is a 10-minute walk to the Moulin Rouge or Place du Tertre, the square where at the beginning of the 20th century many painters such as Picasso lived. 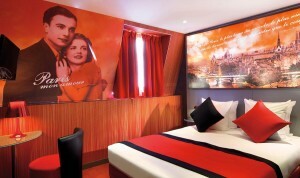 This hotel in Montmartre is perfect for couples on a romantic getaway with rooms designed to explore 5 types of love: eternal love, true love, passionate love, free love, and protective love. There is not a better place to say “I love you”, as you combine the unique atmosphere of love with the delightful Montmartre environment. Prices range from 119 € to 250 € per night. La Terrass Hotel is set in a 19th century building in the heart of the Montmartre village, just a 15-minute walk from the Sacré-Coeur. Guests can admire the Eiffel Tower while having lunch on the rooftop terrace. Its panoramic terrace features large bay windows and offers clear views of Paris. With a really top notch service, prices per night vary from 190 € to 230 € and an amazing view this hotel in Montmartre is ranked in a mid-market hotel position. 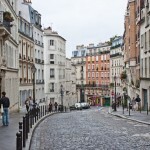 The Basss Hotel is situated in Montmartre village and is just at 10-minute walk from Sacré-Coeur. Highly recommended from Trip-advisor, it is a great solution not only for couples but for families thanks the availability of quadruple family rooms. The rates go from 69 € to 280 € per night, depending the season and room category. 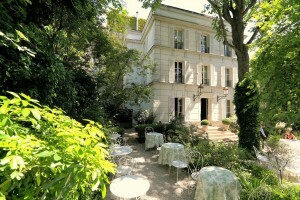 If you are looking for a good value and trendy solution this is your perfect hotel in Montmartre. 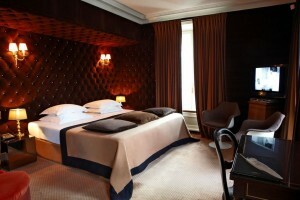 Hotel des Arts is located a 10-minute-walk from Sacré-Coeur with a special view of Paris. The hotel, exposing the works of local artists celebrates their legacy. As a 3 stars-hotel it has rates a little higher with a range of 110 € – 200 € per night, but it is worth it thanks to comfortable rooms and artistic décor which create a memorable experience.